Detailing the physical features, habits, territorial reach and other identifying qualities of the Viceroy. Highly recognized throughout the continent, the orange and black Viceroy one of the most popular butterflies from a regal family. A classic butterfly, the decorative Viceroy is often seen in coloring books, on plates and pottery, and stamped on notecards. It is orange with bold black borders and lines on the wings. White dots form two rows at the bottom edges of the wings. Near the tips of the forewings is a black patch that showcases two bright white spots and a third one closer to the tip. An obvious black line curves across the hindwings. The body is black. 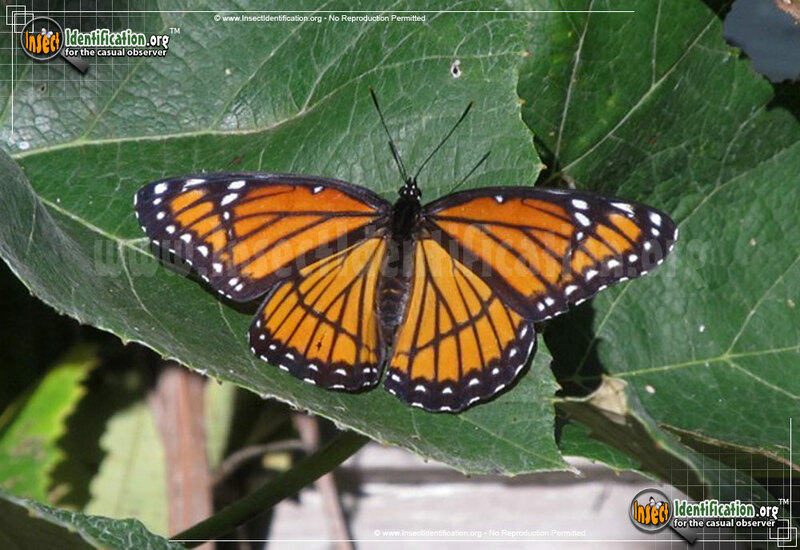 The coloring of the Viceroy closely mimics the foul-tasting Monarch, offering the Viceroy a chance to avoid predators. Caterpillars have just about every oddity one can think of when describing a caterpillar. They have humps, bumps, antennae, and can bend at right angles. In general, they look like bird poop; the brown and white, or green and white kind. Short bristles poke out of small bumps on the body and two black antennae look like they are covered in spikes or prickles. They feed on apple, aspen, cherry, cottonwood, poplar, and willow tree leaves. Look for celebrated adults from late spring through mid-autumn in temperate areas, but year-round in warmer parts of Florida and Mexico. They are fond of wet places like the lakeside, marshes and swamps, as well as drier meadows, thickets and valleys.